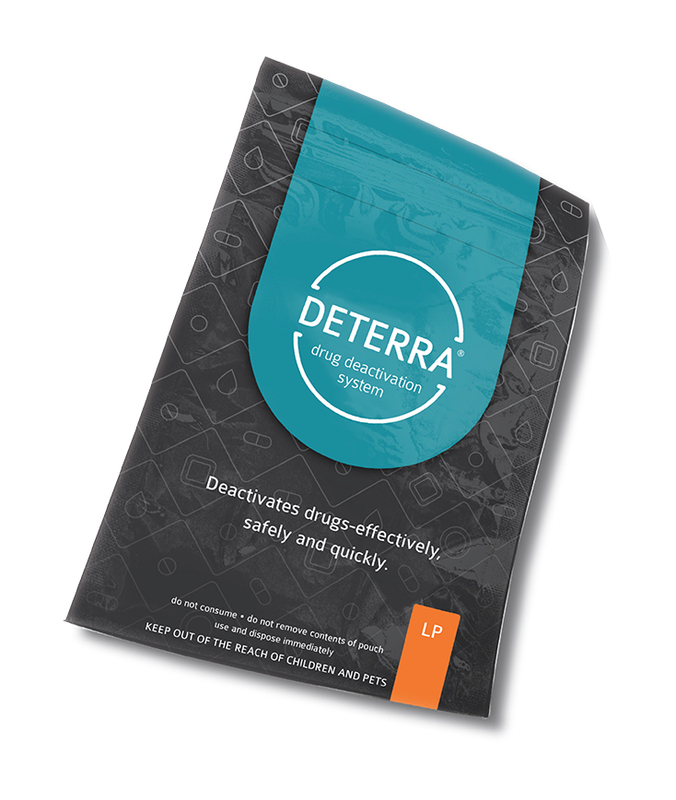 The Deterra® Drug Deactivation System is a new technology that allows patients to safely dispose of unwanted or expired prescription painkillers at home. The deactivation system works simply by dropping medication in a Deterra pouch which contains a carbon that bonds to pharmaceutical compounds. Simply add water and shake it up to neutralize the active ingredient in the drug. The biodegradable bag can then be safely placed into the trash. In the past, pharmacists have often told patients to dispose of unused or expired medications by putting them in cat litter, sawdust, or used coffee grounds. While these materials absorb some of the medication, much of it still remains and can still be dug out of the garbage and potentially abused. Those materials may absorb only 15–23% of the medications. In contrast, the Deterra system neutralizes 98% of the medication, using a form of activated charcoal. The bag can then be disposed of safely, without the risk of the drugs entering the water supply or landfill. KANA is providing Deterra pouches to the community as a part of a multi-pronged effort to curb opioid abuse. Opioid abuse is a national crisis and Kodiak is not spared from the effects. Removing opioids that are no longer needed from the community—through use of the Deterra kits and other avenues—helps prevent people from taking drugs that aren’t theirs. The bags can be used to deactivate pills, capsules, liquid medications, or patches. If you have medication you no longer need, Deterra bags are currently available at no cost through the KANA pharmacy and Kodiak Public Health Center.